Whether you’re holding a school fete, a fundraiser or a full-fledged festival, your choice in fete stalls will have a significant impact on the overall look and feel of your event. At Festival Hire, we have a wide range of available stalls that are not only supremely functional, but will also be the perfect complement to your function’s particular theme and design aesthetic. 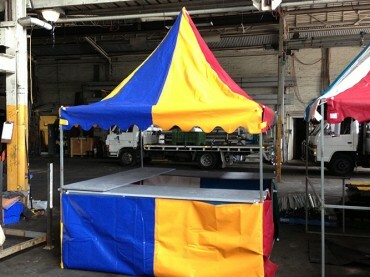 For any enquiries about our fete stalls and other products, including our mobile staging services, get in touch with us today. We serve Sydney and the rest of NSW as well as Queensland, Victoria and Canberra. If you’re uncertain about what your needs are and would like to consult, you can reach us at 1300 761 799. These are our standard stalls and are just the right size for most spaces. They’re especially great for those who want to showcase a variety of vendors and/or products, but who may have space constraints. These come in a variety of colours and can be 2.5m or 3.65m tall. 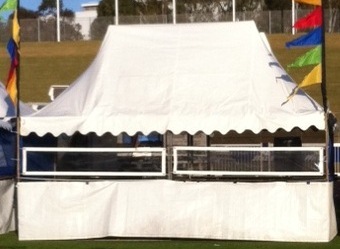 Comes with three 60-cm-wide serving tables. Sometimes all you need to make your festival really stand out are multi-coloured fete stalls. Our coloured stalls have matching tops and skirts and will definitely brighten any space up. Standard 2.4m x 2.4m size with height options of 2.5m or 3.65m. Tables are 60cm wide. Need even more room? 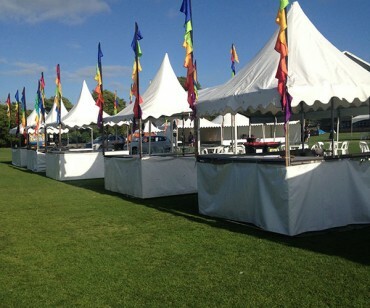 Then you’ll want our double fete stalls, which at 4.8m wide are literally double the width of standard stalls. These are 2.4m deep and 3.75m in height, with three 60-cm-wide tables. 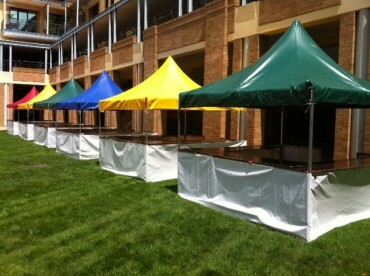 Our market stalls are great for those who need larger serving areas. If you want to feature several products per stall or if you have bigger-sized items, then you’ll appreciate the extra elbow room in these 3m x 3m stalls. Height is 3.47m and the three serving tables are 60cm wide. Comes in multiple colours as well.